(Nanowerk News) More than 150 years ago, William Thomson, later Lord Kelvin, discovered the magnetoresistive effect. Today, this finding enables sensors to measure the rotational speed of a car wheel, and is also used in compass navigation and robot control systems. ETH material scientists have now found a new kind of magnetoresistance that promises further insight into basic research and could one day be used for practical applications. The discovery by Pietro Gambardella, Professor for Magnetism and Interface Physics at ETH Zurich, and his team has just been published in the British scientific journal Nature Physics ("Unidirectional spin Hall magnetoresistance in ferromagnet/normal metal bilayers"). However, advance publication of their work a few months ago on a science platform caused a stir among experts and has motivated other researchers to attempt similar experiments. The magnetoresistance of a conductive material normally remains the same when an electric current changes direction. “However, a new magnetoresistive effect that we discovered changed when the electron flow was reversed,” Gambardella explains. “This is very unusual in metals.” According to physical principles, these microscopic processes should remain independent of the direction of electrons in a metallic conductor. This new discovery is even more surprising considering that the first magnetoresistance effect was observed more than 150 years ago. Resistance measurements are “among the simplest that you can do”, according to Gambardella. In the laboratory at ETH Zurich, old-style electromagnets are placed next to modern superconductors and laser instruments. One of the magnets comes from Gambardella’s earlier workplace at EPFL in Lausanne; he rescued it from the trash before it was carted off for disposal. The researchers clamped samples manufactured in the laboratory in the magnets and measured the electrical resistance at different magnetisation. Electrical resistance is a fundamental property of conductive materials. It indicates how well an electric current can be sent through a wire and is dependent on the magnetisation of the material. In 1856, William Thomson (later Lord Kelvin) discovered that an iron plate’s electrical resistance changed depending on the direction in which the magnetisation ran. This anisotropic magnetoresistive effect (AMR) is used today in a variety of sensors; for example, it is used in cars to measure the wheel speed and the pedal and sitting position, and to control the power steering. AMR sensors are also used in cameras and in engineering and medical technology. They can even be found on Mars; the robots have more than 100 AMR sensors to control the moving parts. AMR sensors are based on thin magnetic layers in which the resistance varies by a few percent depending on whether the current is perpendicular or parallel relative to the magnetisation. French physicist Albert Fert and his German colleague Peter Grünberg discovered a much larger resistance difference of 50 percent in thin-film structures made up of alternating layers of magnetic and non-magnetic materials. For this Giant Magnetoresistive Effect (GMR), the two researchers received the Nobel Prize in Physics in 2007. The GMR effect is used today in, inter alia, magnetic field sensors and to read data on computer hard drives. A GMR structure typically consists of two films of ferromagnetic material, such as iron or cobalt, separated by a non-magnetic layer of copper. If the magnetisation of the iron or cobalt layer is parallel, the structure’s electric resistance is small. If the orientation is anti-parallel, resistance is greater. “We restricted ourselves to two instead of three layers,” explains Gambardella. The researchers’ structure consisted of a thin layer of heavy metal, such as platinum or tantalum, with a thin layer of iron or cobalt above. “The very clever idea for this experiment came from one of our students, Can Onur Avci,” says the ETH professor. With their two–layer samples, the researchers measured a normal AMR effect; as expected, the resistance changed according to the magnetisation of the ferromagnets. Surprisingly, however, they also found a new magnetoresistive effect in which the resistance depended on the direction of the electron flow. 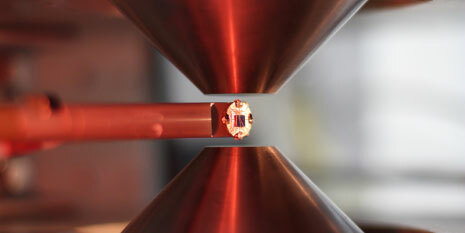 The samples’ strange behaviour can be explained by the electrons’ magnetic moment – the spin. In heavy metals, electrons with opposite spin are deflected in different directions. Electrons with the same spin direction therefore accumulate at the interface of the platinum or tantalum. But if a layer of iron or cobalt is placed on the heavy metal, the total electrical resistance depends on how the accumulated spin and the magnetisation of the ferromagnetic material are aligned. The opposite deflection of the electrons with the opposite spin is called the Spin Hall effect, which is why the ETH researchers dubbed the newly discovered magnetoresistance, which depends on the direction of electron flow, Unidirectional Spin Hall Magnetoresistance. This phenomenon is similar to GMR, according to Gambardella. However, it not only involves a material’s property, but is directly proportional to the amount of current flowing into the material. Nevertheless, ETH researchers warn that expectations should not be set too high: “Our effect is very interesting for basic research, but can’t yet be used in a practical way.” The fractional differences in resistance are much too small. One day, however, customised materials may be produced in which the new magnetoresistance could be used. The researchers are thinking of semiconductors or topological insulators in which the electrons are confined at the interface of different material components and may present amplified magnetoresistances. Spintronics is the name of the field of research that flourished after the discovery of the GMR effect. Advances in this area have applications for the storage and processing of digital information, for example by storing and processing information not only based on charges but also on the spin.